Sorry, no proper update today because I've been writing my next Wired column. It's about how Apple makes me cry... with joy, of course, even when they're announcing their version of gadgets I've already declared the spawn of Satan. I don't say I'll actually relent and buy a cell phone now, but I'm inclined to say that one reason I had to hate the things was simply that Apple hadn't made one yet, and therefore there just wasn't one inspiring enough to splash out on. Anyway, imagine you're holding your iPhone now (rather than June, or whenever it's released near you). What mp3 will you play on it? Why, this one, of course. Jona Bechtolt's France Culture show featuring friends of Blow. 03 Dear Nora - "Defeated and Lonely"
06 Adrian Orange - "No More Wild"
14 Dirty Projectors - "Imagine It"
15 Girl Talk - "Smash Your Head"
16 Momus - "Devil Mask, Buddha Mind"
17 The Konki Duet - "Inflammable"
I may be still in the thrall of Jobs' charisma, but I have to say the iPhone leaves me feeling tickly and excited. They sure make gadgets a joy to use rather than a drudgery. And they care about aesthetics! Who knew? I just heard the "Rock Me Amadeus" song on the radio so I gotta pick that as the MP3 I'll listen to. It's stuck in my head! iPhone + this (http://www.appleinsider.com/article.php?id=2247) = this (http://en.wikipedia.org/wiki/Roland_TR-808). Garageband is shrinking..... a full recording studio in your pocket. IS THIS ONE OF THOSE VIRAL ADVERTS? Delighted, Claire! And I like your track on there! Ah, day #2,348 of being glad to have never owned cell phone. I don't know. from the photos I've seen it seems to be about as big as an adult hand. That's some major stuff to lug around. Yeh that's what i thought. A big greasy nick-able phone. Lot's of school children in East Dulwich getting mugged. I'm going to stick with my old black and white cell phone. RIght now its the only phone i have due to the fact i keep moving about every year. I'm going to stick with just my normal cell phone and use it like one does a phone. Countdown to the thing slipping out of people's hands as they put it to their ears. That thing has a weird shape. Hey, defend The Blow on Wikipedia! I was digging your blog, and the props to Jona and Khaela, when I noticed that there's a big dispute over Khaela's Wikipedia entry. Check it out at http://en.wikipedia.org/wiki/Talk:Khaela_Maricich. This pisses me off, because I played a show with Jona a while back and he was super nice, and I think that they're really doing neat music. Re: Hey, defend The Blow on Wikipedia! The fact that someone has cited their mention in this blog as evidence of their mainstream relevance is incredibly hilarious. Does anybody know what the story is behind Jona not showing at their last Portland show? I asked him when I ran into him later but he didn't say much. While it gives me a big rubbery one I'm more excited to see the technology coming out rather than the excitement and promise of actually getting one. By the time I need to get a new phone (and I'm pretty good with not destroying my phone) I hope that even fairly cheap phones will be as well designed. are apple products really that well designed or are they going for the lowest common denominator ? - which might indeed be the mark of good (fascist) design. I've never wanted a cell phone. I've never had an mp3 player, I want one of those but not enough to get one. I want an iPhone. The phone looks great but I don't think it would fair well in my construction worker pocket. I'm interested in the AppleTV and sending content from my laptop to a hi def tv wirelessly. Looks like it's tied in with iTunes but I'm sure there'll be some workarounds a la Airfoil. I was recently arguing with my grad student room-mate how that hybrid devices are always a waste of energy. How they never give you ample amounts of each "device". You always get a crippled audio player, or a low mp camera, etc. etc. etc. 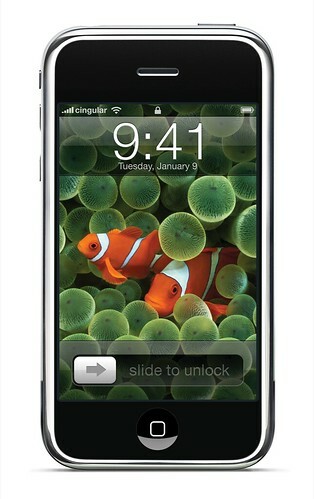 But this iPhone, seems to buck the trend.. hopefully. Except for the low gig ipod, it seems to be on the money. The talk about the casing, about whether or not it'll scratch easy or whether or not it'll slip out of your hands.. both are cheap shots. I think after last years debacle over the nano scratches they've probably done more research than they cared to, to get that fixed. And about the phone being slippery. Once again. I can't see that slipping pass them. They aren't perfect, but again, they do their homework.